But when you reach Tioman Paya Resort, none of that matters anymore, because you'll instantly feel completely one with the Zen atmosphere here. Tioman Paya Resort is a charming rustic resort in a typical Malay kampung-style setting, near the edge of a verdant jungle. The Tioman Paya Resort cabins are basic, so don't expect anything all that fancy. Mind you, this being the case, the price for staying here is commensurate. 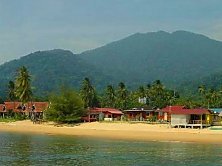 Budget travelers will love Tioman Paya Resort, because it's quite complete, yet comes at a budget price. Book a Tioman Paya Resort room. 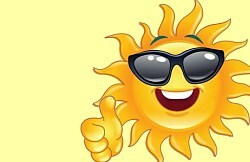 On Agoda.com, you can book now and pay later. One aspect in particular that we liked was the way the chalets are spaced out generously. 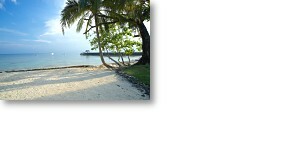 You feel like you've got the Tioman Paya Resort grounds all to yourself. The added benefit of our chalet was that we stayed not too far from the sea's water edge. This made our stay a very pleasant one. 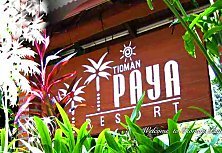 Are there any activities at Tioman Paya Resort? Yes, there are. 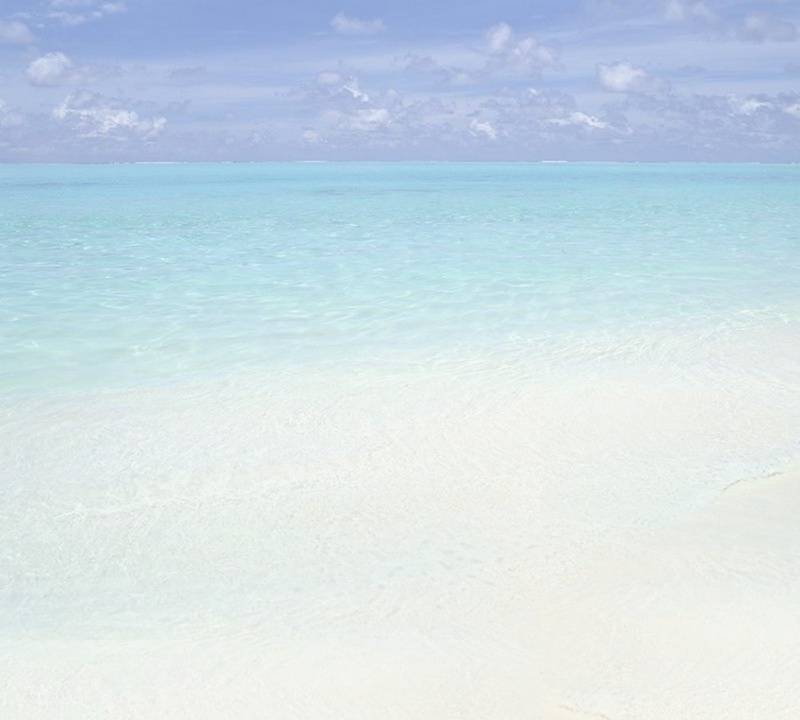 In fact, given the house reef just a few minutes away, you simply must go on a snorkeling outing. The sea here is a comfy temperature and the coral patches around Tioman Paya Resort are teeming with life. Actually, the fact that the sea here is crystal clear made our snorkeling trip the best we'd been on; so much so, that weeks later, back home in Singapore, we'd still occasionally reminisce about our awesome Tioman Paya Resort snorkeling trip. Definitely recommended. But there are land-based activities too. 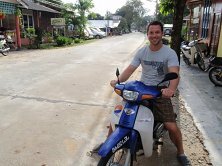 You can go on a guided jungle tour and even a so-called ATV-ride, which is a rough and tumble type trip on a motorized vehicle built specifically for bumpy terrain. It's lots of fun and quite interesting, because you get to go into a real patch of tropical rainforest. We liked the staff of Tioman Paya Resort. They look happy and were always friendly to us. The service at Tioman Paya Resort was good too. So top marks for the personal touch factor at Tioman Paya Resort. To conclude then: Tioman Paya Resort is unashamedly a budget resort. Back-packers and budget-travelers will undoubtedly revel here, because the mood is decidedly idyllic, the Tioman beach get-away package on offer is complete and, best of all, the price is quite modest. Incidentally, families and other travelers that aren't too demanding will also have a blast at Tioman Paya Resort. Just leave behind your pluche carpet and bellhop aspirations and you will be smitten with Tioman Paya Resort. Tip: Select a Deluxe Room. It's more spacious. Also, there's a duty-free shop on the compound, so if you're into alcoholic drinks and ciggies, then you can get these at a good price here. Just be sure you don't bring any of these goodies to Singapore without declaring, because fines are really quite high. Click here if you want to book your Tioman Paya Resort Deluxe Room.